UCI Professor Asantha Cooray in Science Magazine Online Article, 2014. You’ve heard of rogue planets, floating through the universe untethered to any solar system. Now meet rogue stars, which drift through space with no galaxy to call home. A new study has come to the startling conclusion that as many as half of all stars in the universe may be rogue, having been ejected from their birthplaces by galaxy collisions or mergers. Astronomers James Bock of the California Institute of Technology in Pasadena and Asantha Cooray of the University of California, Irvine, didn’t set off to discover a huge population of rogue stars. They wanted to study early galaxies by looking at extragalactic background light, or the EBL. The EBL is essentially all the accumulated light from stars over the history of the universe and ranges in wavelength from the ultraviolet, through the optical, and to the infrared. To get a good look at it, Bock, Cooray, and an international team of colleagues built a detector, called the Cosmic Infrared Background ExpeRiment (CIBER), that could be launched to the edge of space on a rocket and collect images with two 11-centimeter telescopes. The EBL has long been mysterious to scientists. Observing it from Earth is hard because so many other, local sources of light must be stripped away before it is possible to see the light from further back in the universe’s history. 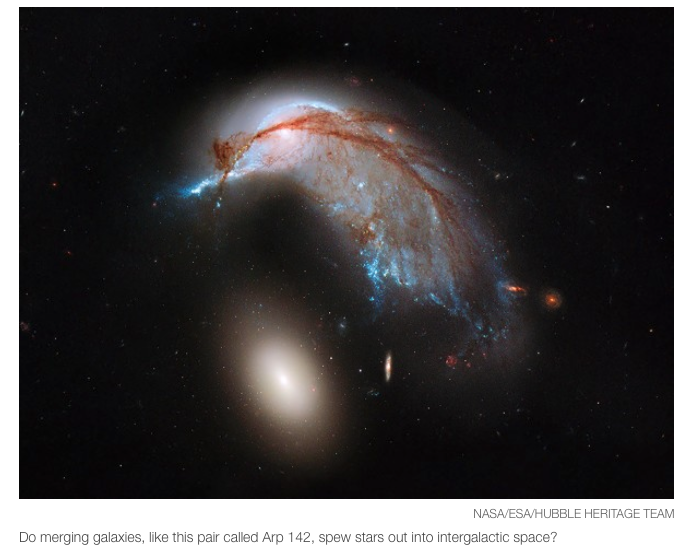 And when astronomers have managed to get a look at the EBL, usually using orbiting infrared telescopes such as Hubble and Spitzer, the ups and downs—or fluctuations—of its light do not appear to coincide with known light sources. About 10 years ago, a team from Goddard Space Flight Center in Greenbelt, Maryland, used the Spitzer telescope to study the EBL and concluded that the fluctuations of light must be produced by primordial galaxies and black holes in the very early history of the universe, says team member Samuel Moseley. CIBER began to look at the EBL during several flights since 2010, followed by a couple of years of intricate image processing to strip out unwanted foreground light. The fluctuations that the team came up with are “inconsistent” with early galaxies and black holes and are much more reminiscent of scattered stars between galaxies, they report online today in Science. The EBL they detected is also much stronger toward the blue end of the wavelengths CIBER can detect, a skew that also suggests a younger source of light. “The fluctuations are there, they’re really bright and they look very blue,” Bock says. “We think it’s stars.” The researchers also looked at the total brightness of the EBL and found that it was in the same ballpark as that from all the known sources—stars and galaxies—at that wavelength. That suggests that there may be as many stars outside galaxies as there are inside. Moseley is not entirely convinced by the CIBER team’s conclusions. His team has identified some objects in x-ray observations by the orbiting Chandra telescope that seem to line up with EBL fluctuations that the NASA team detected. Those x-ray sources are much more likely to be galaxies or black holes than isolated stars, supporting his team’s early galaxy hypothesis. “We’ll have to confirm, but they are hard to accommodate with the star model,” he says. Also, he points out, if there is a huge population of stars outside galaxies, we should see a noticeable number of supernovas occurring out in the middle of nowhere as those rogues stars die. “There are ways to test in the near term. It’ll be an enthusiastically pursued question,” Moseley says. You’ve heard of rogue planets, floating through the universe untethered to any solar system.